This is a fantastic outdoor stereo for your home or cottage. A friend of mine works for Bosch and brought one to the cottage a couple of years back. We couldn’t stop raving about it when we got back home after the weekend. The Bosch is intended for construction sites so the batteries it uses are the same as you would use for you power tools. The roll bar cage protects the stereo from damage if it were dropped at a site. We actually threw the stereo across the lawn while a CD was playing and it didn’t skip a beat. 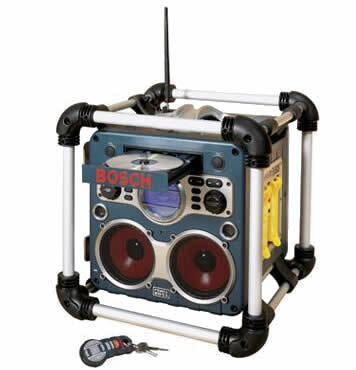 If you have a mp3 player and a transmitter you really have the perfect outdoor stereo system. Just a great product.